There is a book entitled Encounters With the Soul: Active Imagination As Developed by C.G. Jung by Barbara Hannah that I encountered many years ago. Active Imagination is a methodology of talking with one’s inner archetypes as a therapy. Although I’ve never actively imagined, my imagination is quite active. 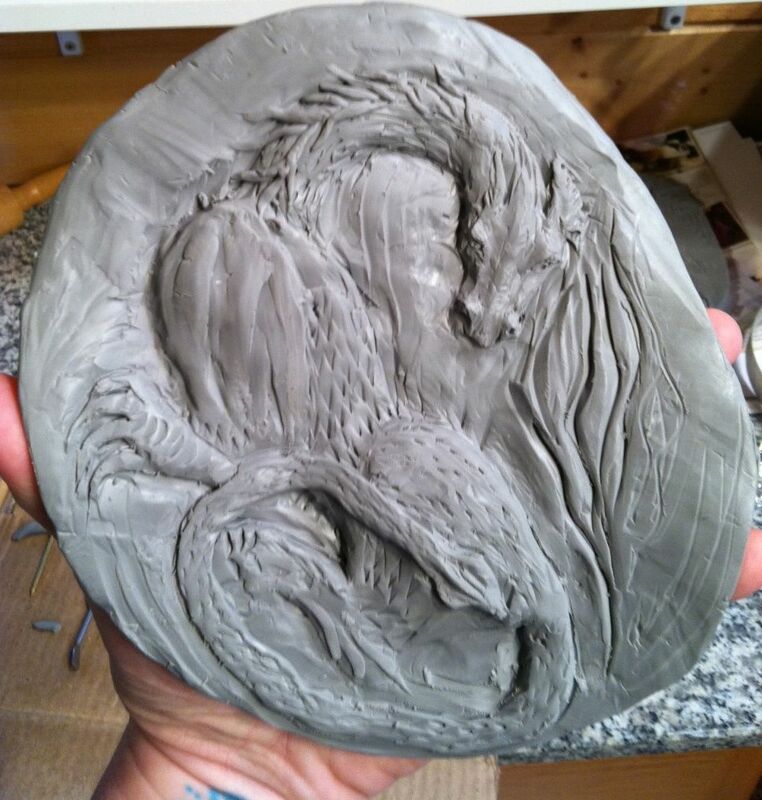 ANYWAY, I was sculpting the other day, making little wall plaques for presents. As I was sculpting, I started telling myself a story a la active imagination about my subject. It’s still under construction, but I like stories with illustrations and I don’t have the time to finish my wall plaque right now. Neither did I want to wait to finish it before I posted my story. The dragon slept, curled like a cat, nose to tail. Her back was towards me, wings folded. Grey scales glistening softly, as my flashlight played upon her mass. She took up the whole of the giant cavern—stalactites mere inches above her slumbering form. She stirred and it sounded like a faint rustling of leaves. I panned my light on the floor to check for the fabled treasure that dragons are said to guard. “There is no treasure,” the dragon said, opening one sleepy eye. “It is a myth.” Her eye glowed red. Hot. I gasped, realizing a) that she was awake and b) that she could read minds. Perhaps I was not as safe as I had once thought. The dragon chuckled softly. It was a warm sounding chuckle, much like one you would expect to hear from a wise grandmother. Indulgent. “Yes, we read minds,” she replied, “But only those minds of those who may mean mischief to our person. And your physical placement to our person is what led us to read your mind.” Her red eye flickered. “Do you realize that the safest approach to a dragon is from behind, as dragons are quite reluctant to breath fire over themselves when quelling a mischief maker? You are either very good at dragon hunting or very lucky,” she told me. Even as she spoke, a torch flared near me with a whoosh, followed by another and another, until they ringed the dragon and shed light throughout the whole cavern. It was a glorious sight! The limestone cavern was milky grey and glistening with quartz crystals. It offset the grey-black scales of the dragon, who lay in its center. She stirred, rapidly winding around herself in one seamless, fluid movement so that she faced me. So fast it happened, I barely had time to register the movement. She towered above me, forcing me to tilt my head back to see her face. Her red eyes bored into me and I stood, transfixed like a bird caught in the gaze of a snake right before it struck. She even did that little cobra-head-weave-thing. “Come forward,” she breathed. I moved against my will. No, I was not safe at all. “What about dessert?” I asked, not feeling assured. She laughed outright at that. The deep rumble from that laugh set up a resonance within my chest, like when you stand too near the lion’s pen at the zoo at feeding time when they are roaring. Her hot, sweet breath swept over me. I inhaled with surprise. She smelled good, a cross between a hot summer’s day, a wheat field at its peak, and a healthy animal. “I have ceased reading your mind,” she said. Sure enough, the hollow feeling I had felt since I’d stepped into her lair was gone. I had wondered what that feeling was. I had thought it was the feeling of being in an immense cavern. “Shall we have a conversation?” my hostess asked me. “Why are you here, little one?” She crossed a huge forearm over her other, stretching her black talons wide. “That may explain it,” she answered, bowing her head acknowledging my complement. “And do you have a question of us?” she asked. I was silent. I had so many questions, all seemed so trivial and silly when face-to-face with the real thing. “I am afraid that I shall insult you,” I told her. “The questions in my head are dumb and stupid. I want you to think I am worthy of conversation and I am not.” I sighed and felt exposed. My face grew warm. “Really?” I asked hopefully, in a ‘small thing’ voice. “Really,” she replied. “That was a good beginning. What next?” She curled her talons and I felt the tiniest bit safer. “Here goes,” I thought before speaking out loud. “How old are you?” I began, allowing the questions to tumble out as they wished. “I am as ancient as days.” She replied. “Is there wisdom just for me that you think I could benefit from?” I asked slowly, inelegantly. I felt the dragon’s pleasure. It warmed me. “Oh!” I said, surprised at the wisdom of my question. “Indeed,” replied the dragon. She cocked her head at me again. She shuddered as if brushing off an annoying insect. Her scales lifted and settled upon her hide. I did not know dragons could do that, control individual scales like that. “May I touch you?” I asked suddenly. “If you dare.” She stretched out that elegant neck, lowering her head within easy reach. Her beauty was compelling and I reached out and to stroke the smooth warmth at the crown, close to what looked like an ear. So warm and alive and smooth she was! I felt fire surging beneath my hand like sap flowing. No. Not sap. She must have felt pleasure as well, for she let out a deep rumble of a purr as her eyes half closed. Her spear-headed tail flicked slightly. Images of flight filled my senses. I closed my eyes, feeling wind blanketing my features. But it was only dragon breath. She had entered my mind again, filling it with her experience of flying. “Oh,” I breathed, inhaling her scent. “Dragon’s breath does not necessairily consume if one takes the proper precautions,” she said into my thoughts. “If you will,” she answered. And she vanished into a mist of grey and black, leaving me….leaving me, how? At a loss for words…. yet alive…. very much alive. Hi Cammy- This makes me think of the unicorns you used to draw and paint in high school! I have met many interesting people in active imagination but never a dragon. It is a lively place, isn’t it? It is a lively place, indeed. I should have a ‘talk’ with a unicorn. That’d be interesting! I should ask it if it felt CSG picked an appropriate mascot!!!! Archetypes fascinate me. Previous Previous post: Where’s The Kitty?